James Hillman sparked a new perspective for me on ‘shrinking’. For him and for me, ‘shrinking’ is a truth of aging. As long as I can remember, I’ve had a very negative association with that word. We ‘shrink’ from responsibilities, from dangers and from the world. No nobility in that, is there? But as we age, most of us will get physically smaller. We will go fewer places. We will socialize less. Most of our circles will noticeably ’shrink’ – and this shrinkage is noted and remarked on, not positively, by those close to us. Who would – who could – find a silver lining to a cloud so dark? Well, James Hillman has, and he makes great sense to my 77 year old self. But it’s only in the last few years I could open to ‘shrinking’ as being a ‘beautiful’ part of the aging process. I imagine some of you may be having similar difficulty. We will all shrink as we age. We need another possibility, a positive possibility, for conceiving of ourselves as we inevitably get smaller, pull our circles in and spend more and more time with just ourselves. And this month’s newsletter does just that. 4. THE SECRET TO NEVER BEING FRUSTRATED AGAIN describes a simple code for how we can consistently delight in the journeying. This vision of shedding, stripping away the false and inessential — and prodding at whatever’s beneath it — is a unifying thread in Hillman’s post-Jungian “archetypal psychology,” and more specifically in his last two books, both of which exhort readers to work at uncovering and cultivating the most intractable, idiosyncratic elements of themselves. In his 1996 bestseller, “The Soul’s Code,” it was the “acorn” of one’s life’s calling (inborn, or so went the book’s unfashionably Platonist thesis) that Hillman chased after. In the just-released “The Force of Character and the Lasting Life,” it’s the edifice of personal character that, he asserts, emerges more clearly as one gets old. Salon Books spoke with Hillman by telephone from his home in Connecticut late last week. SB: At a number of points in the book, you refer to similarities between childhood and old age. There’s a saying that’s often made about the elderly, and usually in a pejorative way: “He or she is entering a second childhood,” meaning basically that the person is losing hold. Could you talk about the parallels between childhood and old age in a more instructive way? JH: First thing that comes to mind is the Japanese idea that at 60, you’re no longer responsible. And you’re much more like a child in your delight and in your spontaneity and in your being excused from certain social formalities. Of course everyone looks up to the old in Japan, but there is that freedom from responsibility — I think that’s the crucial similarity. Another is the release of imagination: In old age and in early years, your imagination is usually freer and less chained to the practical. Partly because you’re freed from responsibility and partly because you’re being marginalized by the society itself. So you’re allowed your fantasies; there’s more room for them. SB: In both cases there’s often a diminished regard for social conventions and conventional wisdom. Your insight can be less encumbered than it is in the prime of life. JH: Yes. The Bible says, the old men shall so-and-so and the children shall so-and-so; they’re treated together again and again. There is the freedom of lack of conformity, of oddity, of idiosyncrasy, of imagination. A peculiar connection to nature. In some societies, tribal societies, the grandfather and the grandson are connected, and they both have a common enemy, you might say, in the generation between. SB: You quote this aphorism from Santayana: “Our distinction and glory, as well as our sorrow, will have lain in being something particular.” How do you think aging serves to bring the more particular aspects of character to the surface? JH: I think some of that middle section about symptoms and disorders speaks to this. They tend to make one a little bit less fit for one’s daily rounds, a little more odd. People find themselves dealing more with peculiarities in their physical lives and psychological lives. Then the character structure emerges more vividly. If you take the question of irritability — that knack for sudden irritability that older people have — I have it. And things seem so much clearer: This is out. It doesn’t belong. I won’t have any of it. My character announces itself through these very sharp distinctions and sharp refusals — these immediate emotional responses to things I love or hate. Music that moves me, say. And there is in this a revelation of what’s really essential to you. You don’t have the space or time for what is not appropriate to you. SB: The book has that interesting interlude about faces in which you make the observation that it’s our encounters with the faces of others — the experiences they contain, the hardships and triumphs and needs they display to the world — that form the basis of our ethical sensibilities. Then you write, “If the face is where the ethics of society begins, then what happens to a society when the aging face is surgically altered, cosmetically subdued, and its accumulated character falsified?” Well, what does happen then? JH: The elder who is eliminating what time has done to the face, what life has done to the face, is making a statement for others to see: This is the way to be a good old person — it is to defeat this body that is doing things to you. Because you haven’t changed. Your body’s changing. It’s doing these things to you, and it’s unfair. You feel like you did when you were 30. Your innocence remains. And this is the message these changed faces are presenting. The supermarket’s filled with many other faces, especially if you live in a poor district as I do, there are many faces that carry suffering and tragedy and defeat. But no one wants to look at them, and usually no one does. SB: Here’s another quotation from the book: “The easy path of aging is to become a thick-skinned, unbudging curmudgeon, a battle-ax. To grow soft and sweet is the harder way.” What does one need to do, or to remain mindful of, to cultivate that harder way? JH: To yield a lot. Yielding. Let the other guy win. Take a simple example: You hire somebody to do something around your house and you pay them their price without arguing about it. Or you give a little larger tip than you’re accustomed to at dinner. Or you allow the waitress to make her mistake. Now these are usually infuriating things, and it’s very easy to go right off. Restaurant rage! But there’s something about yielding — presenting your opinion about something, as the old buzzard that you are, but letting it go, too. SB: What is it you gain by yielding? JH: You’re more flexible, you can go with life, you can receive life. You don’t know what impressions you’ll be open to once you’ve let down your own fixed positions — which tend to be defenses, refusals to let anything else in. You lose some of the fears you have about defending what you believe, or what you experience. Fear is a huge thing for older people. The older people that one admires seem to be fearless. They go right out into the world. It’s astounding. Maybe they can’t see or they can’t hear, but they walk out into the street and take life as it comes. They’re models of courage, in a strange way. SB: One more passage from the book: “Late in the night, we realize that the acts of our lives have not been shadow-free, that we are shadowed by curses and sins — not because we are cursed and sinful by nature, but because with the very origins of the world, one half of which belongs to night, come fearful figures who demand we know them.” This suggests that as we age, it becomes easier to forgive ourselves for the missteps and transgressions that have gone before. Can you say more about why this becomes easier? JH: I’m not sure it becomes easier. I put a lot of emphasis on contrition. I think that you really face the hurts you have done to people close to you — lovers, wives and husbands, associates. I think that contrition goes with aging. There’s more time for reviewing those things, because the projects — what I’ve got to do every day — are diminished. A lot of the advice we give to old people in America is about starting a new career at 65! “I used to work for the railroad, but now I’ve taken up pottery and opened my own little shop.” And that’s fine. I don’t object to it. It’s only that there’s something else the soul may need besides activity. SB: This reckoning with past demons that you’re talking about — is it fair to say it’s partly a matter of coming to take one’s actions and oneself less personally in a way? JH: Yes, yes. I think that’s a good point. It doesn’t sound that way; it sounds like a matter of personally owning your past. But I think you begin to see them in a larger perspective. “Wow, I was really wrapped up in envy. I really did envy that guy.” Or “I was really paranoid for a while — I was haunting my husband.” Or my wife. We get a better perspective on the phantoms that have taken hold of us at different times in our lives. And you can be a much better mentor, a much better elder to others, if you’ve met all those night-time demons. Because a mentor needs to have faced the fears and the shame that assault younger people — and as you get older, you do come to better terms with those bugaboos known as fear and shame. SB: This is obviously a book whose point of view and whose imperatives have been dictated to a large extent by your own experience of aging. If you don’t mind my asking, what has been the hardest thing about growing older for you? JH: Well, it’s not physical. The most difficult thing I have to cope with is that I’m still terribly crowded with things I haven’t finished and want to do. I mean, my own work. It isn’t that I want to go to the Gobi Desert. What I wrote about pulling in the outposts, that’s absolutely true. When I say things I want to do, it isn’t things I want to own or things I want to learn, or even duties that I feel I need to serve, like some political cause. It’s really the fact that I owe my work something, and I don’t feel I have the time, or maybe even the competence, to do it justice. That’s the most difficult thing I have to deal with. I’ve given up a lot of keeping up with things. I can’t read all the books I want to read, I can’t watch all the phenomena that interest me in the world. The work calls me, and sometimes I wonder whether this is an obsession and I should drop it, or it’s a necessity I’m obliged to fulfill. How do you tell a necessity from an obsession? Steve Perry is a writer and critic who lives in Minneapolis. “Does what goes on inside show on the outside?,” young Vincent van Gogh despaired in a moving letter to his brother while floundering to find his purpose. “Someone has a great fire in his soul and nobody ever comes to warm themselves at it, and passers-by see nothing but a little smoke at the top of the chimney.” A century later, Joseph Campbell stoked that hearth of the soul with his foundational treatise on finding your bliss. And yet every day, countless hearths and hearts grow ashen in cubicles around the world as we succumb to the all too human tendency toward choosing what we should be doing in order to make a living over what we must do in order to feel alive. How to turn that invisible inner fire into fuel for soul-warming bliss is what artist and designer Elle Luna explores in her essay-turned-book The Crossroads of Should and Must: Find and Follow Your Passion (public library) — an intelligent and rousing illustrated manifesto that picks up where Campbell left off, in the spirit of Parker Palmer’s emboldening guide to letting your life speak and Debbie Millman’s visual-essay-turned-commencement-address on courage and the creative life. Distinguishing between a job (“something typically done from 9 to 5 for pay”), a career (“a system of advancements and promotions over time where rewards are used to optimize behavior”), and a calling (“something that we feel compelled to do regardless of fame or fortune”), Luna recounts the pivotal moment in her own life when she was suddenly unable to discern which of these she had. As an early employee at a promising startup, she was working tirelessly on a product she deeply believed in, and yet felt disorientingly unfulfilled. She found herself before a revelatory crossroads: the crossroads between Should and Must. Should is how other people want us to live our lives. It’s all of the expectations that others layer upon us. Sometimes, Shoulds are small, seemingly innocuous, and easily accommodated. “You should listen to that song,” for example. At other times, Shoulds are highly influential systems of thought that pressure and, at their most destructive, coerce us to live our lives differently. When we choose Should, we’re choosing to live our life for someone or something other than ourselves. 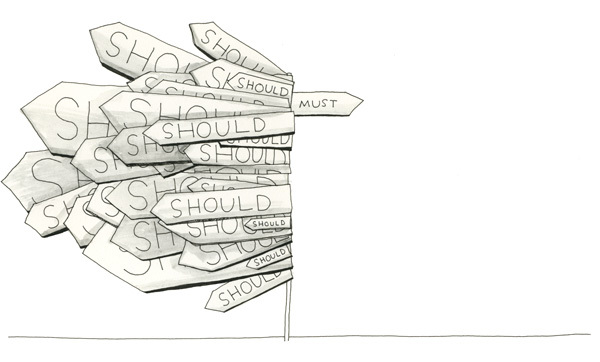 The journey to Should can be smooth, the rewards can seem clear, and the options are often plentiful. 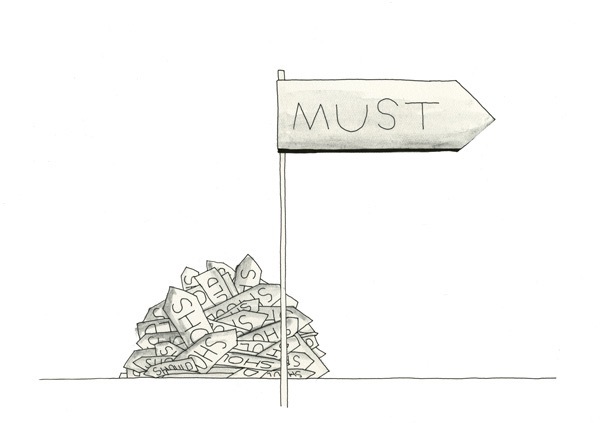 Must is different. Must is who we are, what we believe, and what we do when we are alone with our truest, most authentic self. It’s that which calls to us most deeply. It’s our convictions, our passions, our deepest held urges and desires — unavoidable, undeniable, and inexplicable. Unlike Should, Must doesn’t accept compromises. 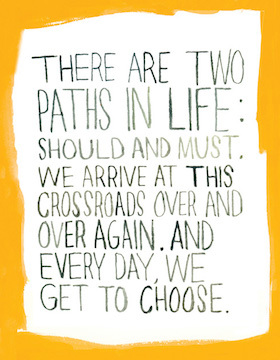 Choosing Must is the greatest thing we can do with our lives. If you want to know Must, get to know Should. This is hard work. Really hard work. We unconsciously imprison ourselves to avoid our most primal fears. We choose Should because choosing Must is terrifying, incomprehensible. Our prison is constructed from a lifetime of Shoulds, the world of choices we’ve unwittingly agreed to, the walls that alienate us from our truest, most authentic selves. Should is the doorkeeper to Must. And just as you create your prison, you can set yourself free. One of the most common ways in which we imprison ourselves is by comparing ourselves to others and, upon finding our situation inferior, placing blame — on circumstances that we feel are unfair, on the people we believe are responsible for those circumstances, or on some abstract element of fate we think is at play. The self-defeating catch is that we often end up judging our circumstances against others’ outcomes, forgetting that hard work and hard choices are the transmuting agent between circumstance and outcome. How often do we place blame on the person, job, or situation when the real problem, the real pain, is within us? And we leave and walk away, angry, frustrated, and sad, unconsciously carrying the same Shoulds into a new context — the next relationship, the next job, the next friendship — hoping for different results. Must is fantastic, and Must is just on the other side of Should. Should is this world of expectations — it’s like a camouflaged force. That’s one of the tricky things about Should — it can kind of creep in there when you’re not looking. It’s easier — it’s this invisible force moving against us [and] it often comes very early on in life. It can come from the time into which we’re born, the society or the community into which we’re born, the body into which we’re born… It can be a lot of different things that happen early in life [which] really take on that trajectory … and have us often running a different race than the one we were intended to run. This article originally appeared in Brain Pickings and is republished with permission. The author, Maria Popova, is a cultural curator and curious mind at large, who also writes for Wired UK, The Atlantic and Design Observer, and is the founder and editor in chief of Brain Pickings. What’s the fix for this? One guy came up with a solution that deals with all of these problems — and more. The guy in front of you is driving like an idiot. Your boss is being a jerk. Your partner isn’t listening. And sometimes these all happen to you on the same day. Albert Ellis was quite a character. He was controversial. Outspoken. A bit of a rebel. In fact, the book he’s most famous for was titled: How To Stubbornly Refuse To Make Yourself Miserable About Anything-yes, Anything. Clever but a bit unprofessional, right? Here’s the thing: according to a survey of psychologists he was the 2nd most influential psychotherapist ever. Sigmund Freud came in third. In general REBT is arguably one of the most investigated theories in the field of psychotherapy and a large amount of clinical experience and a substantial body of modern psychological research have validated and substantiated many of REBTs theoretical assumptions on personality and psychotherapy. His stuff works. And it’s as simple as ABCD — quite literally, as you’ll see below. So how can you never be frustrated again? Let’s break it down. You don’t get frustrated because of events. You get frustrated because of your beliefs. And where did this idea start? Ancient philosophy. Stoicism. That’s where Ellis found the concept. And then he proved it really worked. You’re stuck in traffic and that makes you angry, right? Wrong. Here’s an example. I say, “This headache remedy probably won’t work but give it a shot.” So you try it. And it doesn’t work. You’re not frustrated. Okay, same situation but I say, “This always works.” It fails. Now you’re annoyed. What changed? Your expectation. Or you tell a five-year old to stop yelling. They don’t listen. You don’t get that bothered. After all, the kid is five. Again, nothing changed but your belief. Pretty straightforward, right? But that leads to a question: how do you change your beliefs? Ellis has an answer. It’s as simple as ABCD. Really. A is adversity. Traffic is awful. B is your beliefs. And often they’re irrational. “This shouldn’t happen to me.” Well, guess what, Bubba? It is happening. C is consequences. You get angry, frustrated or depressed. In very few cases can you change A. But you can change B. And that will change C. So let’s bring in the 4th letter. Look for beliefs that hold the words “should”, “ought” or “must.” That’s where the problems lie. You’re allowed to wish, want and desire. Nobody is saying you need to be an emotionless lump. But you can’t demand the universe bend to your will. That’s where the frustration and anger creep in — because that godlike insistence isn’t rational. When you’re angry, frustrated or depressed look for those irrational beliefs. “People should treat me kindly and fairly all the time.” Sound rational? Hardly. “I ought to succeed at this. If I don’t, I’m a failure and a loser.” Really? “This person must love me back or I’ll die.” No, no, no you won’t. What were you anxious or overconcerned about? Meeting new people? Doing well at work? Winning the approval of a person you liked? Passing a test or a course? Doing well at a job interview? Winning a game of tennis or chess? Getting into a good school? Learning that you have a serious disease? Being treated unfairly? Look for your command or demand for success or approval that was creating your anxiety or overconcern. What was your should, ought, or must? Is disputing your irrational beliefs going to immediately change everything? No. But when you start disputing you’ll see that your expectations aren’t in line with reality. And with a little work, those expectations will start to change. A is Adversity. Like traffic. Sorry, no genie can let you wish it away. B is Beliefs. Look for beliefs with these troublesome words: should, ought and must. “Traffic shouldn’t be this bad.” Not rational. Traffic is what it is. Sorry. C is Consequences. You banging the steering wheel with your fist and sending your blood pressure into the stratosphere. D is Dispute. Are you demanding the universe and everyone bend to your wishes? Is that rational? No way. You can want, you can wish and you can definitely try your best in the future, but you cannot demand if you want to stay happy and sane. Life is not perfect. People aren’t perfect. You, dear reader, are not perfect. And that’s okay. But having beliefs that any of these things “should” be the way you want causes you a lot of unnecessary suffering. Many of your irrational beliefs are not immediately obvious. Sometimes you’ll have to dig to find them. And you’ll need to dispute them a fair amount before new reasonable beliefs kick in. But you can definitely make progress. What did Epictetus, the great Stoic philosopher, say way back in the first century AD? People are disturbed not by things, but by the views they take of them. What did Shakespeare write in Hamlet? There’s nothing either good or bad but thinking makes it so. Rarely can you change the world. But you can always change your thoughts. And that can make you very happy. This entry was posted in Father William's Musings on August 2, 2015 by Father William.